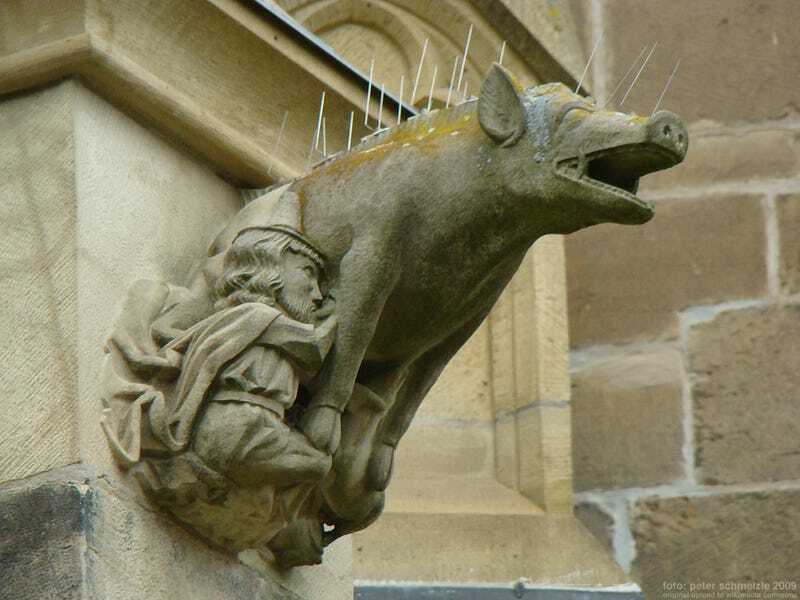 Known as "Judensau," or the "Jew's Sow" the design motif focused on images and sculptures of devout Jewish engaged in obscene interactions with large sows, an animal that in the Jewish faith is seen as "unclean." The usage of the figures seemed to be most popular during the 1300's, and due to a large amount of the images being found in German locations, the judensau is often considered to be exclusive to the country, however examples have been found in a number of European countries (it is important to note that there is no evidence of a lasting connection or influence between this medieval imagery and modern anti-semitism). Judensau imagery appears in graffiti under church benches, in woodcuts, and as illustrations in pamphlets, and most extant as sculpted ornamentation in the stone churches of the time. Many of the chiseled insults remain today and can still be seen in medieval churches across Europe. While the judensau are wildly offensive stereotypes, they do mark a unique and unfortunately specific reminder of how far into the past the roots of anti-semitism stretch.